With the latest sales figures from 2009 at over $6.9 billion dollars, it seems everyone has tried an energy drink at some point. With claims to improve concentration, energy, stamina, even athletic performance and weight loss it’s not a wonder this is the fastest growing beverage market with sales expected to top $9 billion in 2011. But are these claims true? More importantly, are these drinks safe? While occasional consumption of these beverages likely won’t produce ill effects for an otherwise healthy adult that may not be the case for those who drink them chronically or already have preexisting conditions such as diabetes, liver, kidney, or heart disease. That goes for kids who drink them regularly as well. The active ingredient in energy drinks is caffeine. 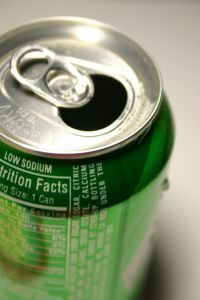 Most energy drinks fall within the range of 50 to 300 milligrams of caffeine per can. The general guideline for caffeine intake per day for kids is around 100 mg and around 400 mg for adults. For adults, caffeine toxicity begins around 1000 mg and can be deadly at amounts greater than 3000 mg. These estimates can vary depending on health and other preexisting conditions, however. For children, the toxic or lethal amounts could be far less. Many energy drinks offer 3 to 5 times the amount of caffeine contained in the average cola. But that is just through comparative analysis of listed amounts. Many energy drinks contain even more caffeine through additives such as guarana, which typically contains around 40 to 80 mg of caffeine. The caffeine content from these ingredients, however, is not required to be listed by manufacturers making actual caffeine amounts likely higher than listed on the can. Because energy drinks are classified as dietary supplements and not categorized as food like soft drinks, they do not fall under the same regulation and do not have caffeine content limited by the US Food and Drug Administration (FDA). Caffeine intake within recommended guidelines like those mentioned above typically does not result in adverse effects. However, amounts greater than recommended often do. Those sensitive to caffeine, or with medical conditions like heart disease or diabetes, or pregnant women may experience problems with caffeine even within normal ranges. If you do consume energy drinks, follow these tips for safe consumption. Seifert, Sara, Judith Schaechter, Eugene Hershorin, and Steven Lipshultz. “Health Effects of Energy Drinks on Children, Adolescents, and Young Adults.” Pediatrics 127.3 (2011): 511-528. A NetMed Pediatrics Guide . Web. 20 Mar. 2011.